Direct sun exposure on walls, especially west- facing walls (and south-facing walls in the summer) can significantly increase the loads on your cooling system—roof overhangs and porch roofs to the rescue! Many types of external shading de- vices that can keep heat from entering the building are o en recommended in lieu of prescribed low solar heat gain coefficient windows on southern exposures in passive solar design. These can include pergolas, awnings and patio covers. Shading a window on the outside of the glass is twice as effective at reducing heat gain as doing so inside of the house. is is the best strategy for reducing cooling loads and lowering energy costs. 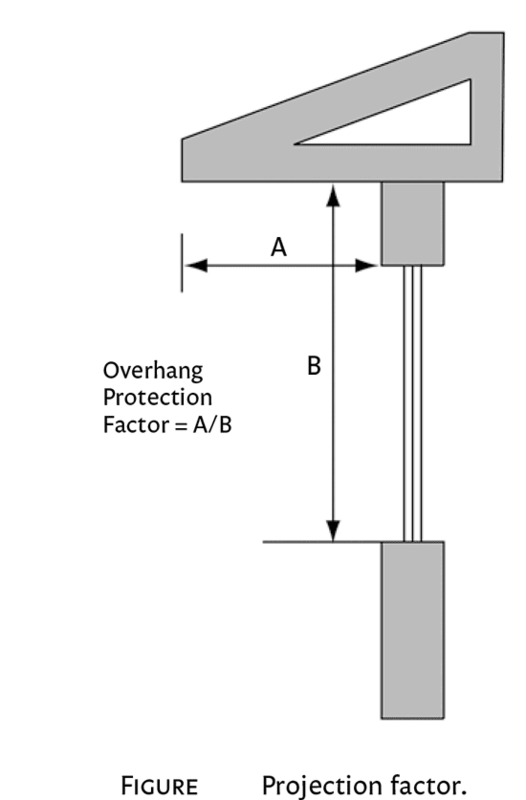 Individual awning structures mounted directly above windows can provide more protection, being closer to the window, than an over-hang that is several feet above. Of course, the projection factor, or the ratio of the depth of the overhang or awning to the height above the sill of the window be- low it, will influence its effectiveness in shading all or portions of the window over the cycle of the sun’s path between the solstices. By using the projection factor formula, we can design the shading device to precisely control which months the sun is allowed to shine into these windows. Even in the north, you don’t need solar heat gain in July. Never underestimate the benefits of any shading devices. As was previously mentioned, they also serve to protect exterior doors and windows during major rain or storm events. However, if external structural devices are not possible, trees can provide shade, either continually or seasonally. If your site does not have trees, neighboring buildings or other existing features can provide the desired shading on the east and west sides of your home. Surely I will never underestimate the benefits of any shading devices. I will consider construction companies who knew this kind of stuff.